An electronically controlled manual gearbox, the Man/Auto features electronically managed clutch and gear-shift functions. As a result, the car has no clutch pedal and the gear lever —which remains present —has no mechanical link with the gearbox. 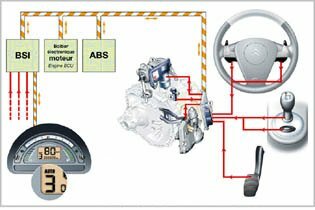 The Man/Auto gearbox is managed by a control unit, which controls two actuators. One actuator changes gears while the other, which is equipped with a facing wear compensation system, opens and closes the clutch. The gearbox control unit also dialogues with the engine control unit. This sophisticated electronic management system takes into account all the parameters necessary for efficient gear-changing: gear lever, accelerator, brake, engine and gearbox rpm, vehicle speed, ABS, ESP, engine torque and temperature. In this way, when the gearbox control unit receives an order —in either operating mode —to change speeds, it briefly cuts off the engine’s powerflow, disengages the clutch, changes gears, engages the clutch and authorises power to be restored. These operations are sequenced as quickly as possible to minimise the break in acceleration. The Man/Auto gearbox reaps the benefits of the experience acquired by PSA Peugeot Citroën with the auto-adaptive gearbox. 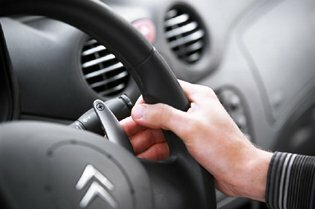 To avoid changing gears too frequently, gear shifts are conducted at different speeds during acceleration and deceleration. * Comfort : In automatic mode, the driver does not have to change gears: a major advantage in heavy traffic. In manual mode, the driver no longer has to take a hand off the wheel to select the gear required. * Safety : Eyes on the road and hands on the wheel, the driver concentrates on the road ahead. A dashboard indicator shows the current gear-speed and mode of operation. * Consumption : Automatic mode optimises gear shift management to bring savings of 0.2 l/100 km in a standard combined cycle.